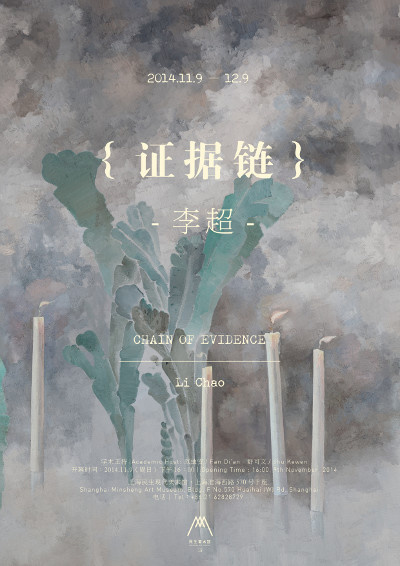 Chain of Evidence: Li Chao’s Solo Exhibition includes around 40 oil paintings created by the artist from 2011 to the present. With Shu Kewen, Fan Di’an as its academic directors, it will be unveiled on November 9th, 2014 at Minsheng Art Museum, Shanghai. 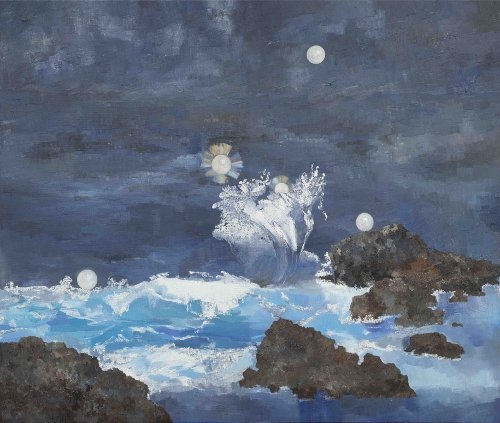 Li Chao graduated from the Mural Painting Department of CAFA in 2007. For such an active young artist, association, memory, conjecture and their interaction seem to be filled with suspense, but they actualize themselves as visual evidence. The conflict and suspense is mysterious and to be cracked. To be converse is the motivation of many of his paintings. Presenting the traits of a painting is also a way to be converse. He is countering another fashion to avoid painting pure images. The emphasis on certain images is a kind of willfulness, as well as honesty, acknowledging the limitation and prejudice of knowledge. Thus, painting images is a rehearsal of revealing proof, and the painter can retreat and start all over again. All the people, outfits, objects and behaviors are synchronical. They merely emerge as proof and identify themselves. We, as the audience and witnesses, exist with them synchronically. The thick clouds do play the role of the hidden, or the unfocused brink. In Distance, Bionics and The Black Swan are likely to be interpreted as thick clouds. These paintings are set in a landscape-like scene, so it is logical for thick clouds to be present. They can probably serve, experientially, as thick clouds in the picture system. There is a blue curtain in See You Faraway, which doesn’t help to cover anything. The true covering is the “thick clouds” behind the curtain that cannot be pulled aside, which is the same case as in other paintings. The clouds in Conch Girl and Soap Opera, bright as they are, are still thick and cannot be dispersed; they simply add some depth of field to the picture. There are banana trees, a man holding an umbrella, two tortoises and some lighted candles in On a Rainy Day. There are precedents for banana trees to appear, with “raindrops drumming rhythmically against the banana leaves” as the foreshadowing; the umbrella is also in accordance with the title; but the tortoises, as well as the candles, seem weird. Various images converge, but except for the little reflection of the tortoises and the man, neither the umbrella nor the banana trees respond to the rain. The images of The Ivory Tower, Brain Washing and Bionics obviously emerge as the subordinate of the words. But the subordinate relationship of the images is temporary, and the temporary moment simply ruins the semantic meaning and brings it back to chaos without generating a new meaning. No matter what images happen to emerge in the chaos, the painter won’t gift them with too much information, or they are even removed of the trace of time. For instance, in paintings such as Grain in Ear, Herb Gathering and Combing Wind, all the people, outfits, objects and behaviors are synchronical. They merely emerge as proof and identify themselves. We, as the audience and witnesses, exist with them synchronically. 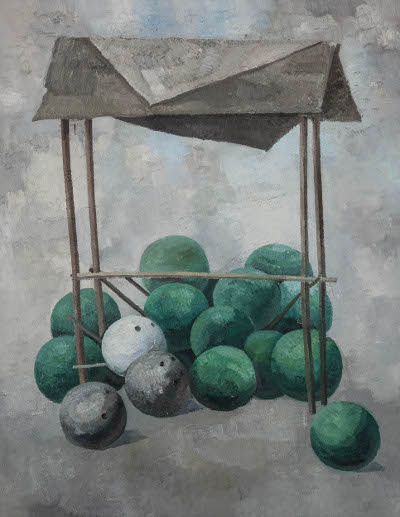 Courtesy of the artist and Minsheng Art Museum, for further information please visit www.minshengart.com.